It’s Classics weekend at Epsom as the cream of middle distance 3yos battle it out over the Epsom Downs. The fillies start it off on Friday in the Oaks and then the colts do battle in Saturday’s Derby. Epsom has been hosting both races since the late 18th century and it’s a course that has it quirks. It’s a fairly sharp track and the sweeping downhill turn into Tattenham Corner, plus a constant camber down the home straight, require a horse with good balance. Inability to handle the track isn’t uncommon and can be the downfall of some (perhaps none more so than when joint fav Lyphard nearly ended up on the stands side in 1972). It’s also a big test of a horse’s temperament with the huge crowds beside the rails throughout . The 3yo fillies look a good bunch this year and the division could well be stronger than the colts for once. 11 runners are due to go to post and it’s possible to give theoretical chances to all – though I am inclined to rule out the two outsiders – Bellajeu and Qualify – as their form doesn’t match up to the others’ standards. Highest official rating belongs to 1,000 Guineas heroine Legatissimo who outstayed her rivals at Newmarket. She has already proven herself over further than a mile (winner over 9.5 furlongs) but isn’t a guaranteed stayer at this trip on her sire’s side. I’m also not sure if this was the strongest of Guineas this year and that the Irish equivalent may have had more strength in-depth (Malabar ran in both and was beaten further at The Curragh). Ryan Moore has chosen her in advance of the candidates from the Aidan O’Brien stable so that has to count against them but it would have been hard for him to pass by a Classics winner. Jack Naylor represents the Irish 1,000 Guineas form and also holds Legatissimo on 2yo form. At their respective prices I would prefer her but it is a worry that the Irish race was less than 2 weeks previous and she may not have had enough time to get over it. It was a surprise however that Frankie Dettori chose to ride Jazzi Top for John Gosden instead of Star of Seville and that does make me wonder about the York form a little more. Jazzi Top’s half sister Izzi Top was 3rd in this race but subsequently looked more of a 10 furlong filly. She’s certainly a decent filly but I’m inclined to think this trip may just be over Jazzi Top’s optimum distance also. Diamondsandrubies is the perceived second string of Aidan O’brien on jockey bookings. Having Seamie Heffernan on board should not be a negative as he steered the stable’s 20/1 outsider Was to victory in this race in 2012. More of a problem for Diamondsandrubies could be the ground. All of her best form is on softer ground – her mother Quarter Moon was second in this race and also preferred some give. If the heavens opened and there was any great deterioration on Friday it should be greatly to her benefit. Lady Of Dubai and Al Naamah are from respected stables but both need to step up a little on what they have achieved so far. Last but not least is the one contender who displayed a real ‘wow’ factor on her only run this year – Crystal Zvezda. Sir Michael Stoute hasn’t won this race since 1987 (his 1989 runaway winner Aliysa later disqualified) but I think it highly significant he has pitched this filly in this grade so early. She comes from a good family and has two siblings who have been close to Group One level – Crystal Cappella and Hillstar. Like them she started this season on a very workable handicap rating. Unlike them this wasn’t exploited and she was thrown straight into listed company at Newbury. She showed an electric change of pace to go from last to first in a few strides there. The two siblings improved throughout their 3yo careers to reach Group level and if Crystal Zvezda shows anything like the same improvement as them (her sire Dubawi also produces stock who tend to progress as they age) she really could be quite a really exciting filly at the highest level. 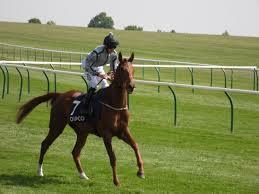 She ran as straight as gun barrel at Newbury- a good sign that she is well balanced enough for Epsom. 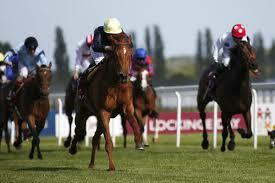 She has also a win to her name at Lingfield – a course fairly similar in characteristic to Epsom . The one negative is here is most definitely the odds. A day after her Newbury win 8/1 was widely available. She has since contracted to such an extent that no more than 7/2 currently. There is one recommendation on Friday’s back-up card in the opener at 2pm. She was a close second in this race this year to a horse that would be comfortably better than anything she’ll meet this time. That came after a good run at York and Odeliz has had the same preparation this year. At York she travelled very well but looked to be outstayed – this shorter trip should be ideal and she is proven over the course. There is only one rival on a similar rating in the field (all the rest rated 7lb or more behind). That one is last year’s 1,000 Guineas runner up Lightning Thunder. Lightning Thunder does have a regressive profile though and hasn’t matched her Guineas form since. The form has been going downhill and there was very little fizz to be seen on her seasonal debut when well down the field at Lingfield. I think Odeliz is overpriced at 3/1 as she is probably perceived to be a ‘professional runner-up’ to some. I think that’s unfair and she is in no way unreliable – she has just run consistently well against horses who have had better ratings. Thunderstorms did arrive on Friday morning and enough rain fell to take any sting out of the ground but without making the going soft. No further watering seems to be planned and so with the forecast largely clear now it’s possible the ground could be a bit quicker tomorrow. Terimon reached the frame at a whopping 500/1 in 1989 but at least he had won a race prior to running here. Carbon Dating’s best effort has been 3rd of 4 and his form is some way behind the rest of these. 1000/1 would be nearer the mark. French raider who has had problems with the starting stalls – so much so that it prevented him from running in the French Derby and he had to be rerouted here. Has a Group 1 win to his name as a 2yo although probably didn’t beat a lot that day. His form on his return was let down by the winner in the French Derby but that was on much softer ground. Could improve for the better ground but may well need to. His temperament will be under test here as well. The choice of Ryan Moore makes him the number one challenger from the powerful Aidan O’Brien stable. A setback prevented him from making his seasonal debut in the Chester Vase (replaced by Hans Holbein) and he didn’t reappear until 2 weeks ago when a close second at The Curragh. He still looked a ‘work in progress’ there and it wasn’t clear at the time if he would be running at Epsom. He must be showing the right signs at home though as he’s now considered a strong contender and was heavily backed down from 14/1 earlier this week. Has a high head carriage in his races but while that can be a mark of not being totally genuine it appears to be more babyishness in his case. He’s a full brother to 2013 winner Ruler of the World and in terms of pedigree has perhaps the most ideal fit for a Derby winner. His sire Galileo also won the race – as did that one’s half brother Sea The Stars. (Siblings Morston and Blakeney also victorious in the 1970s). Improvement is needed to win but it wouldn’t be a surprise to see him making it. A worry would be if the ground got much quicker than Good– his brother was disappointing on Good to Firm ground – and Giovanni Canaletto has yet to race in such conditions. The favourite for the race since an impressive win in York’s Dante beating Jack Hobbs and Elm Park. This unbeaten horse had still looked quite green on his reappearance run at Newmarket but looked much more professional last time when readily outpacing his rivals. He wasn’t entered for the Derby at the time and owners stumped up a £75,000 supplementary fee to get him in. Therein lies his main issue as he wasn’t entered as connections thought he may have a stamina issue. Has the strongest form in the book and will be hard to beat if he lasts home. Not really considered as a Derby prospect for the O’Brien stable until he became the late replacement for them in the Chester Vase and won (beating Storm the Stars). That win on soft ground confirmed his stamina – if anything he may have too much of it for Epsom and longer races mat be for him in the future. His best form is also on softer ground. The ‘second string’ of the Gosden stable behind the fav Golden Horn. Beaten comprehensively by that horse at York but did look the more immature of the two (both on only their 3rd runs there) and could improve. He looked to hang a bit under pressure there and that might be a concern on this track although he did seem to please connections when working on the course last week. The third of the O’Brien runners won a weak looking Lingfield Trial and Aidan doesn’t normally send one of his A Team to compete in that. Stamina again isn’t a problem but he needs to improve a lot on what he’s achieved to prove a threat to me. I do find it interesting that Joseph O’Brien seems to have picked him in preference to Hans Holbein though. 8th in the 2,000 Guineas. He ran quite well there considering it all went wrong at the start and had it not been for that could well have been 4th or 5th. He should improve for increasing from a mile but while his sire is a strong influence for stamina, his dam was a sprinter so stamina at this trip is far from guaranteed. A close runner-up to Golden Horn as a 2yo he’s been described a ‘bit of a baby’ by trainer William Haggas this season. He looked to get unbalanced a bit both at Chester (2nd to Hans Holbein) and when winning at Goodwood last time. His last win confirmed his upward curve but the trainer didn’t seem to pinpoint the Derby immediately after that race. I do have concerns that this track won’t be ideal for him as he still looks immature and I think his inclusion here could be more to do with the wishes of the owner rather than the trainer. This Irish challenger is the race’s other supplementary entry. Unbeaten this season he has readily won two of Ireland’s main Derby trials. They were on soft ground though and it is questionable what he has actually beaten. Neither sire or dam is an influence for stamina but in winning over 10 furlongs he has already won over a lot further than he should. Elm Park would have been a solid each way pick for me if it weren’t for the reports of how he acted on the track. Giovanni Canaletto was definitely interesting at around 14/1 when he was confirmed earlier in the week ( I did have an interest then) but all value has now disappeared as he is single figure odds. Of the big prices, Storm the Stars and Moheet would appeal for those looking for a small each way punt. Storm the Stars is sure to stay – Moheet isn’t but at 50/1 that factor is built into the odds. Looks a duel between Dolniya and Flintshire. The latter came out best in last year’s Arc but Dolniya has improved this year and beaten the colt both times they have faced one another. Quickening ground will suit Flintshire and he is proven over the course unlike Dolniya. 5 furlong handicap over the quickest sprint track in the world. Many runners have previous form in this. Caspian Prince won it last year by nostrils from Seeking Magic with Steps very close in 4th. It’s the second who comes out best at the weights tomorrow and his seasonal debut run at Newmarket looked a proper warm up for this.